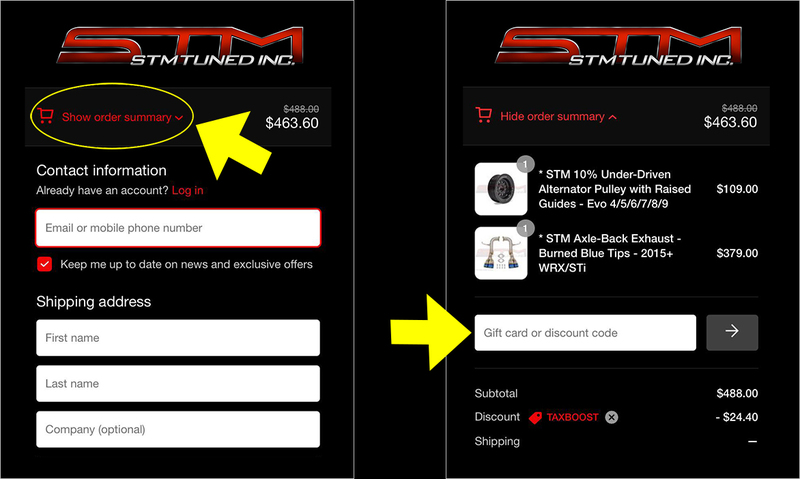 STM Discount Codes and Promotions STM Discount Codes and Promotions | STM Tuned Inc.
We love giving you deals! You support us, we support you! Below you'll find our current promotions and discount codes and some FAQ answered! Don't forget to make an account and take advantage of out Boost Reward Points! If you have any questions or concerns, as always, feel free to contact us. Code "STM10" will save you 10% on most STM parts! 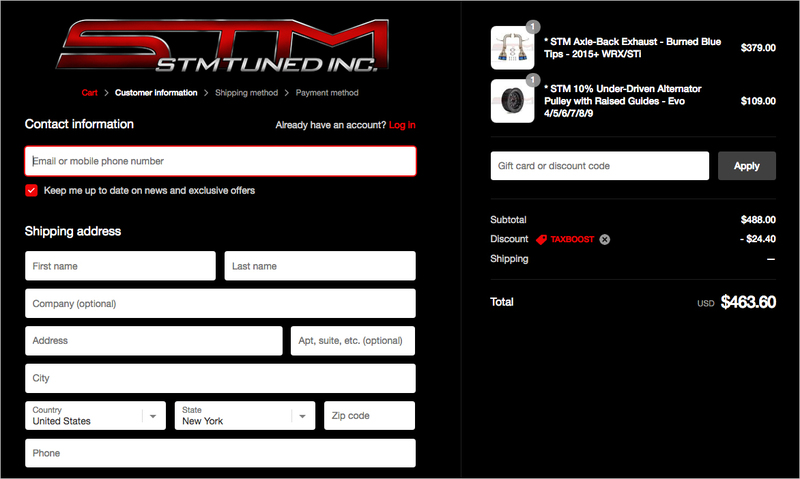 "STM parts" includes our exclusive lineup of STM USA made products! Code "TAKE5" will save you 5% on most other parts and brands site-wide! Exclusions apply. Some products and manufacturers have strict pricing policies and are excluded from any discount codes. You may still apply your STM Boost Reward Points. Some products and manufacturers have strict pricing policies and are excluded from any discount codes. You may still apply your STM Boost Reward Points! We currently offer free shipping on all orders over $200.00 to the lower 48 United States (excludes Alaska and Hawaii.) No code necessary. If you apply a discount code and your cart total drops under $200, free shipping will not be activated. The total amount AFTER all discounts is what triggers the free shipping. Only one Code can be used at checkout. Go to Checkout Page or verify your PayPal or Amazon Pay account. Go straight to Checkout with your credit card, or use your PayPal or Amazon Pay. If you select PayPal or Amazon Pay, you'll be redirected to their page to verify your information, then back to us. It's ok to click "Continue" on their verification page, this isn't the final step and you'll come back to us to finalize the details and discounts before you pay! Split screen display will show you your items on the right and you enter your code there and proceed. If you are on a mobile device, the layout stacks. Click the "Show Order Summary" at the top to enter your code and review all items. Only one coupon code may be used at a time. All set! If you have any questions, feel free to give us a call!